Locum family physician in British Columbia, the Northwest Territories, and Ontario who has completed a fellowship in global health. Problem being addressed Medical emergencies occur commonly in offices of family physicians, yet many offices are poorly prepared for emergencies. An Internet-based educational video discussing office emergencies might improve the responses of physicians and their staff to emergencies, yet such a tool has not been previously described. Objective of program To use evidence-based practices to develop an educational video detailing preparation for emergencies in medical offices, disseminate the video online, and evaluate the attitudes of physicians and their staff toward the video. Program description A 6-minute video was created using a review of recent literature and Canadian regulatory body policies. The video describes recommended emergency equipment, emergency response improvement, and office staff training. Physicians and their staff were invited to view the video online at www.OfficeEmergencies.ca. Viewers’ opinions of the video format and content were assessed by survey (n = 275). Conclusion Survey findings indicated the video was well presented and relevant, and the Web-based format was considered convenient and satisfactory. Participants would take other courses using this technology, and agreed this program would enhance patient care. Web-based learning has been widely evaluated in health education and found to be at least equivalent to other methods in terms of provider satisfaction, knowledge, and skill, and patient effects.32 Advantages include increased convenience, accessibility, cost, and ease of use over other learning formats.33 Well designed Web-based tools are effective,33,34 and effectiveness increases if tools are multifaceted, contain multimedia,29,35,36 and implement other evidence-based strategies.37 Additionally, such tools can be disseminated broadly with ease. As emergencies occur commonly in the offices of busy physicians and many offices are unprepared, physicians and their staff might benefit from an evidence-informed, Web-based educational video to help prepare for office emergencies. However, such a tool has not been described in the literature. Develop an online educational tool, based on recent literature, to help physician offices prepare for office emergencies. Evaluate the attitudes of physicians and their staff toward the content, format, and effectiveness of the video. providing training for office emergencies. From the script, a video was filmed, edited, and uploaded to YouTube.com. A program website (www.OfficeEmergencies.ca), created using Google Sites and tracked using Google Analytics, provided additional information and multifaceted resources to viewers, and allowed for online evaluation of the video. Two strategies were employed to improve the response rate and to meet the ethics requirement for informed consent: the video was locked for viewing exclusively on the program website (despite being hosted by YouTube), and the survey was placed directly below the embedded video. Design: A retrospective survey administered after watching the video was used to evaluate the program. Ethics approval was received from the University of British Columbia Research Ethics Board. The video was accessible only to participants who provided informed consent. Survey: No directly relevant validated questionnaires have been published. Instead, a survey about technology-based education was located46 and used with permission (e-mail communication with A.B. Bynum, September 2011). The survey, composed of 15 demographic questions and 5-point Likert scale questions (1 = strongly disagree, 5 = strongly agree), was hosted by Google Docs and was anonymously self-administered on the program website after the video was viewed. The data collection period was from February 15 to May 14, 2012. One survey question was excluded (“The presenter made time for questions”) as it was not relevant to this program. Sample-size calculation and statistical analysis: There was no upper limit set on the number of respondents. The survey was expected to receive at least 100 responses from the targeted populations, which would provide a margin of error (half-width of a 95% CI) of less than 10% in the percentage of individuals who respond agree or strongly agree to a survey question. The 5-point Likert scale responses were aggregated into 3 groups: strongly disagree and disagree; undecided; and agree and strongly agree. The percentage of responses and 95% CIs were calculated for each of 5 professional groups: family physicians, other specialists, residents, nurses, and medical office staff. Overall percentages are reported without 95% CIs, as the mix of professionals in the sample is not representative of any relevant population of health professionals. Statistical analysis was conducted using SAS software for Windows, version 9.3. During the data collection period 1256 unique visitors viewed the website and 806 viewed the consent form. The survey and video page was viewed by 768 unique visitors; of these, 275 completed the survey (response rate of 35.8%). Most respondents (94.2%) self-reported Canada as their geographic location; respondents varied in terms of reported occupation, and respondents outside the target audience of this program were excluded from further analysis (Table 2). Quantitative survey responses by profession, with 95% CIs, are presented in Table 3. 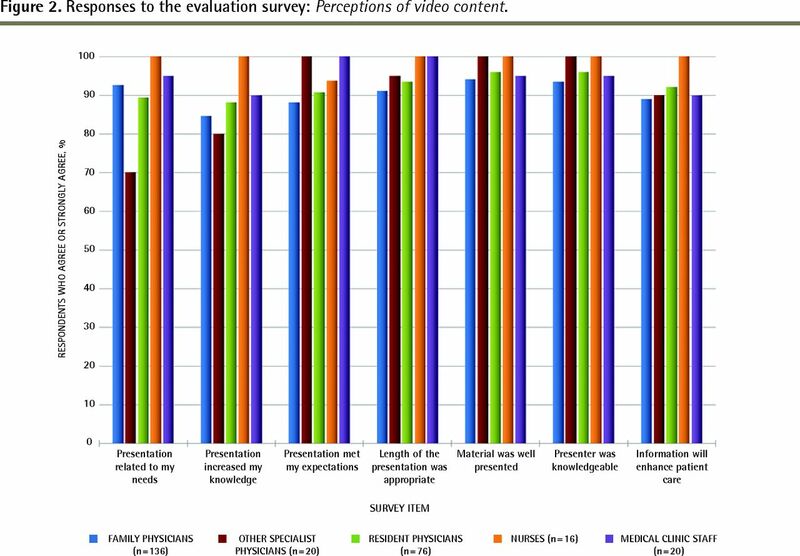 Responses for the agree and strongly agree group are graphed by profession in Figure 2 (responses pertaining to video content) and Figure 3 (responses pertaining to video format). Box 1 lists representative respondent comments. Responses to the evaluation survey: Perceptions of video content. 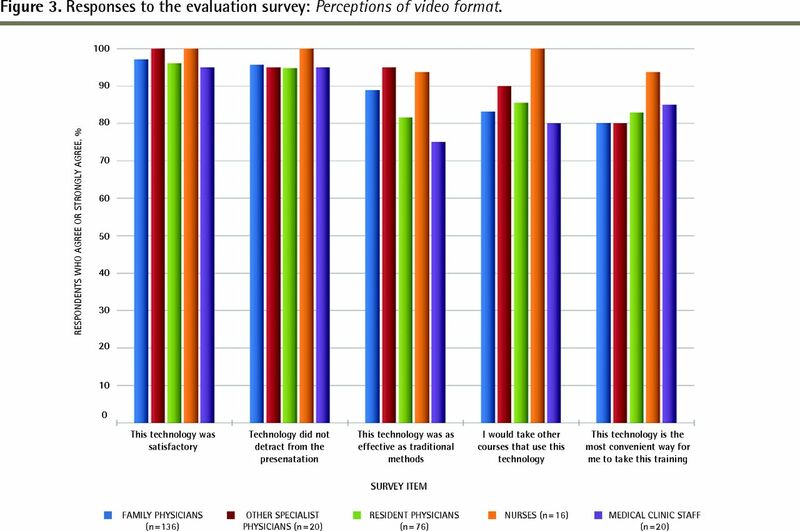 Responses to the evaluation survey: Perceptions of video format. Self-reported demographic characteristics of all survey respondents: N = 275.
results of the survey conducted after watching the video assessing attitudes toward video content and format, by self-reported occupation: N = 268. Representative survey feedback comments:There were 89 comments in total; 10 quotations believed to be representative of the original 89 were chosen by the editors. Similar statements were grouped together, with the number of duplicates in brackets. Quotations were corrected for spelling. This video introduced and was a reminder for the importance [of] being ready for office emergencies and provided good resources, but did not provide me with any valuable information for actually dealing with an office emergency effectively. Telling a story or a case may be more interesting, illustrating the important points about having equipment available and trained staff who know what to do in case of emergency. Thanks so much, gives a model to compare to what we have in place and what we need to implement. I know I should have more equipment in the office ... but which ones are “must[s]” and which ones are “nice to haves,” etc? Any CME [continuing medical education] that can be done at home at a time that suits me (and my family) is beneficial. Very appropriate and innovative. This should set a standard for similar presentations. The video met the expectations of 90.9% of all participants, and 90.2% agreed or strongly agreed the video was relevant to their needs. The online video technology was considered satisfactory by 96.7% of participants, and the video length was considered appropriate by 93.1%. Only 4.8% of respondents perceived the video to be less effective than traditional methods, and 95.3% stated the technology did not detract from the presentation. This technology was the most convenient way for 81.8% to take this training, and 84.7% would take other courses that use this technology. The material was deemed by 95.3% of respondents to be well presented. The video presentation was perceived by 86.2% to have increased their knowledge, and 94.5% of respondents agreed the presenter was knowledgeable. Almost all respondents (90.2%) agreed this video would enhance patient care; out of 268 respondents, only 4 (1.5%) disagreed. Before this video, there were no documented evidence-based online instructional tools to prepare physician offices for emergencies. The only identified comparable intervention was a mail-out of pediatric guidelines, which has the disadvantage of increased expense, difficulty of distribution, and minimal effectiveness in improving equipment availability and training.31 Programs that distribute emergency equipment and stage in-office mock codes free of charge for physicians7,17,47 are likely more effective than this video, but have the disadvantage of increased cost to replicate and disseminate compared with an online video. The evaluation indicated that physicians of several specialties, medical clinic staff, nurses, and residents strongly supported this program as a well presented and effective tool to prepare for office emergencies. Respondents indicated that this video has the potential to not only increase health provider knowledge, but also improve patient care. In addition to the positive feedback for the video content, the Internet-based format of the video was strongly supported as a satisfactory and convenient way to take this training. The online video format was considered valuable, well received, and useful. 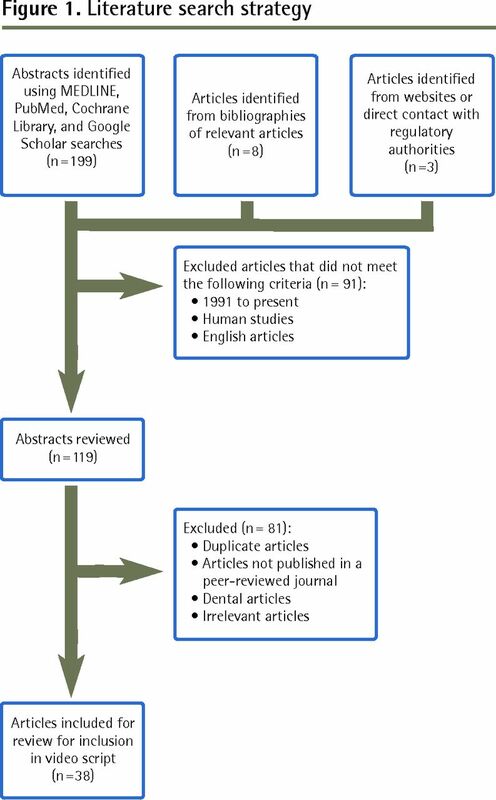 These findings are consistent with previous publications on Web-based learning32–34 and suggest this program might be an effective alternative to guideline mail-outs. An ideal educational program results in participant change,48 and use of a multifaceted strategy, as used by this program, can increase effectiveness.36 Further improvement could therefore include expansion into a formal educational program containing additional components such as small group longitudinal workshops; learner assessment; and follow-up to ensure adoption of knowledge and acquisition of equipment. Because the program was so well received, learners might benefit from similar videos depicting specific individual emergency situations. There is also a need for relevant Canadian guidelines; in combination with this program, these could play a role in improving awareness, training, and patient outcomes. On a broader scale, this research suggests that the YouTube video was a welcome, convenient, and effective learning method that could be considered for future medical education topics. Because the program was designed as a resident project, its scope was limited by the project requirements. For example, the residency program mandated use of a previously published survey; as no similar program had been published, the questionnaire used was not entirely suitable and could not fully evaluate this program. As well, the duration of the project was constrained, so respondents could not be randomized or controlled; a longer data collection period could also have resulted in an increased number of respondents. Furthermore, despite its multidimensional design, this program is only rated at level 1 on the Kirkpatrick model of effectiveness of medical learning.48 Higher levels of effectiveness, such as objective short- or long-term improvement in participant knowledge, behaviour, training, equipment acquisition, or patient outcomes resulting from the video, were not assessed. Although 81.8% of respondents agreed the online format was the most convenient way to learn about this topic, these results are likely biased toward individuals who are comfortable accessing information online. As well, given the emphasis on Web-based methods of recruitment, participants who use the Internet less often were less likely to be recruited; this bias might have been reduced by using both print and online recruitment methods. An online video was created to educate physicians and their staff regarding medical office emergencies. Evidence-based continuing medical education strategies were incorporated into the creation of the program, which included information from a recent evidence review and all existing policies from Canadian regional regulatory bodies. An evaluation of the program indicated that the participants believed the video was well presented and relevant, and would enhance patient care. The Web-based format of this program was considered a convenient and satisfactory means of learning about office emergencies, and respondents expressed interest in learning about other topics in a similar manner. I thank Mr Aaron Colyn and the Nanaimo Film Group (video filming and editing); Dr Rachel Carson (concept); Dr Andrew McLaren (equipment); the video cast and crew; Ms Rachel McKay and the Centre for Health Evaluation and Outcome Sciences at the Providence Health Care Research Institute and the University of British Columbia Faculty of Medicine (statistical and manuscript advice); and Dr Kathryn King (supervision). Funding was provided by the University of British Columbia Family Practice Residency Program and Research Awards and the British Columbia College of Family Physicians Research Award. This program found that an online video was a convenient and effective way to train physicians and their staff to handle medical office emergencies. Survey respondents found this particular video to be well presented and relevant, and believed it would enhance patient care. There is potential for the use of online medical training videos to be expanded to other medical education topics, as the format was well received. La traduction en français de cet article se trouve à www.cfp.ca dans la table des matières du numéro de janvier 2015 à la page e17. , editors. Childhood emergencies in the office, hospital, and community. Organizing systems of care Elk Grove Village, IL: American Academy of Pediatrics; 2000.
, editors. Your office as an emergency care site. Emergency medical services for children: the role of the primary care provider Elk Grove Village, IL: American Academy of Pediatrics; 1992:38-9.
. 911 in your office: preparations to keep emergencies from becoming catastrophes. Pediatr Ann 1996;25(12):664-6, 668, 670. passim.
. Office emergencies and emergency kits. J Am Dent Assoc 2002;133(3):364-5. Emergency cart medication and equipment. Vancouver, BC: College of Physicians and Surgeons of British Columbia; 2014. Available from: https://www.cpsbc.ca/files/pdf/NHMSFP-AS-Emergency-Cart-Class-3.pdf. Accessed 14 Dec 2014. A practical guide for safe and effective office-based practices. Toronto, ON: College of Physicians and Surgeons of Ontario; 2010. Available from: www.cpso.on.ca/uploadedFiles/policies/guidelines/office/Safe-Practices.pdf. Accessed 2011 Sep 16. Procédures et interventions en milieu extrahospitalier. Montreal, QC: Collège des médecins du Québec; 2011. Available from: www.cmq.org/fr/Public/Profil/Commun/AProposOrdre/Publications/~/media/Files/Guides/Guide-Procedures-Interventions-ExtraHosp-2011.ashx?11229. Accessed 2011 Dec 4.
. Video helps docs prepare for medical emergency. Vancouver, BC: British Columbia Medical Journal Blog [website]; 2012. Available from: www.bcmj.org/blog/video-helps-docs-prepare-medical-emergency. Accessed 2012 May 21.
. Where did I put that adrenaline? Vancouver, BC: Message from the Department Head [website], University of British Columbia Department of Family Medicine; 2012. Available from: http://blogs.ubc.ca/generalpractice/2012/02/25/where-did-i-put-that-adrenaline/. Accessed 2012 May 21.
. Be prepared for emergencies in the clinic/office: I know I wasn’t. Vancouver, BC: Dr. Ottematic [website]; 2012. Available from: http://drottematic.wordpress.com/2012/02/17/be-prepared-for-emergencies-inthe-clinicoffice-i-know-i-wasnt/. Accessed 2012 May 21. You are going to email the following Are you ready for an office code blue?